Combine the onion, garlic cloves, gold and sweet potatoes, carrots, parsnips, cauliflower and tomatoes in a roasting pan and toss with the olive oil, fennel and thyme. Season with sea salt and fresh pepper, to taste. Add about a cup of the broth and roast the vegetables for about 45 to 50 minutes, until they are tender. Stir at least once during roasting. When the veggies are roasted, pour the rest of the broth into a soup pot and bring to a high simmer. Add the roasted vegetables (including any liquid and all the bits and pieces from the pan). Cover the soup pot and simmer gently for about 10 to 15 minutes. Using an immersion blender puree the soup (don't have an immersion blender? Find one here). Add the coconut milk, stir and taste for seasoning adjustments, and warm through gently. 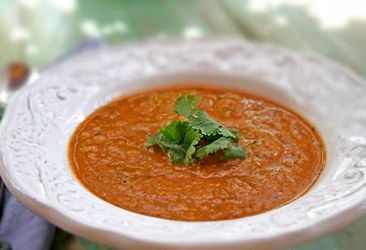 Add more liquid if your soup is thicker than you prefer; if it is too thin, cook a little longer to reduce the liquid.